* Minor bug fix for druid AI. * Slightly larger popups at larger text settings. * Can view the entire battle log by pressing on it. * Dark borders were sometimes transparent, fixed. * AI can now stumble into stealthy units. * 3 tabs on preferences screen. * Added quality setting and frame rate limit to preferences. * Battle units are zoomed up a bit when possible. * Press F1 (or menu button) in transfer units screen to bring up a menu. * Pinch to zoom on map. * Game can now be built for the android platform. * Fixed freeze at start of battle bug. * Many new sea and coastal creatures. * New coastal behavior that keep the monster close to the shore in the water or on land. * New capital in Dawn of a new empire. * Counsilors in new capital. * More differentiation for societies. * Empire got an emperor in the capital. * Capital emperor part produces soldiers and peddlars. * A new small fire effect with less sound and particles. * Changed sound effect for summon serpent spells. * Non-burners can enter burn screen (b) too. * A second demon mastery did not always result in more spells, fixed. * New graphics for some units. * Necrotod only hypnotizes every second round. * Support for new screen resolutions. * Serial number shown on preferences screen. * Linux: ALSA playback could stop after an underrun, fixed. * Mac: Retina displays could get wrong fullscreen size, fixed. * Market village became sea when loaded in map editor. * The amount of Hands of Glory wasn't cleared between games, fixed. * News screen that shows changes between versions. * Cost of send greater horror reduced 50 -> 40. * Linux: Raspberry PI defaults to max texture size 512. * If the first player was not present when starting a network game the second player would get a blank world to look at, fixed. * Faster disconnects from network server. * Confirmation for turning player into AI in network game. * Linux: JACK sound support was broken since last version, fixed. * Event messages written to debug log as well. * Get to choose between load/random even after canceling out of a loaded map. * Mapediting: Triggers didn't work with negative location values, fixed. Triggers with random locations will get a different trigger location each turn. * Fungus growth event was not saved, fixed. * Map screen performance improvements. * Shortcut 'c' for create random map. * --simpgfx for simple graphics (for slow computers). * Faster and more responsive new turn generation. * Linux: Support for Raspberry Pi ($30 computer). * Linux: Fixed bug in ALSA shutdown and error handling. * Fixed flickering terrain info popup. * Boosted gold mine attacks. * Number of units at current recruit location shown on recruitment screen. * Keyboard shortcuts 1-9 to recruit units. * Ctrl + 1-9 to switch locations on recruitment screen. * Option to make sure no random player becomes the same class as another player. * Allied stack without a commander are drawn without square. * Trade reform, max tradeable amount depends on the price of the item traded. So you can buy twice as much iron compared to human sacrifices. * Relics can now be traded. * Corrected number of eyes on plants, spiders, scorpions and some more critters. * New terrain: Market Village. * Network: Disconnected players during 'enter name' get a random name. * Network: Disconnected players are no longer skipped if they aren't connected. * Network: --noturnintoai switch to disable the 'turn into ai' option for disconnected players. * Map screen performance improvement. * Ophan got a proper attack. * Arch Angel got a real firebrand. * Message for Pontiff donations said John Doe instead of real name, fixed. * Converted squares remained converted even if altered to a non settlement, fixed. * Mad Cultist left his gate, fixed. * +1 armor for riders of the apocalypse. * Altered movement behavior of El troops. Saints and Angels move full speed now. * Updated SDL library for OSX version resulting in much better scroll wheel behavior on new macs. * Easier to get rid of 'repeat ritual'. * New class: Voice of El. * Added battle and transfer unit shortcut lists to misc menu. * Modding: Unique is taken into account for mastery powers. * New modding command: loner (same type of units take damage if in same square). * Did not get to see last turn when winning a network game, fixed. * No quit confirmation required after someone has won the game. * 'j' = previous commander. * Descriptions for Demonologist and Witch powers. * Modding: ritualevent, making it possible to trigger an event after a ritual. * Modding: event no longer requires the -1 number afterwards. * Modding: Multiple mastery rituals possible. * New modding commands: masteryname, masterycostB, masterycosttypeB, sumcostB, sumcosttypeB. * Mouseover 'lvl' in attacks will show what path the spell comes from. * Shorter delay for reload. * Animate Armor shortcut changed to 'R'. * New modding command: startitem. * Symbol for Spawn Monsters ability. * Shift can be used to select a range of units. * Terrain symbol shown when selecting terrain in map editor. * Mapediting: clusteredstart, commoncause and scoregraphs can be turned on/off by map commands. * Modding: Maximum abilities per monster increased. * --nomods and --loadmod switches. * --graphs and --commoncause now works for non random maps too. * AI is now more likely to create large armies if necessary. * Mapediting: pos -5,-5 = trigger position. * Modding: Changing dose names for summoning rituals could crash the game, fixed. * Modding: Changing ritual names did only take effect after a load game, fixed. * Increased maximum nbr of recruitables 48 -> 128. * Maps: New triggers, chanceevent, onechanceevent. * Modding: Can now add map events to mod (event, endevent). * During evil times bandits will now pop from brigand lairs even if they are owned. * Front row pikeneers are now placed in the rearmost front rows. * Modding: Copystats no longer copies the name of the monster. * Modding: Mastery rituals will now give a full set of spells to monsters that increase their spell casting ability more than one level. * Auto spawned monsters were not added to retinue automatically if spawner was under the command of another commander, fixed. * Old weapon masters should not appear in the sea any longer. * Drought shown in income details for herbs and weed. * Ettin was missing from troll king's recruitment offers, fixed. * Gateways are now ownable by everyone. * Monthly ritual possible for Enchanter and Slave Hunting. * Sound is now started before graphics. * Linux: Timeout when connecting to pulseaudio server. Should fix freeze for people who have pulseaudio installed but not active and with autospawn off. * Modding: Explicitly setting summoning cost type to gold would cause an error message, fixed. * Doubled the amount of special abilities a single monster can have. It was possible to run out when giving lots of summoning powers to a commander. * Fixed glibc dependency problem introduced in 3.09 that prevented the game to run on older Linux distros. * Baron starts with longbowmen instead of archers. * Most horrors are now immune to disease. * Certain earth spells like earthquake no longer affects flying and/or no longer deals magic damage. * Fishes will drown if they stay on land. * Modding: Replacing sprites from copystated monsters replaced sprite of original monster as well, fixed. * Modding: classdescr, libbonusdescr, templebonusdescr. * Changed sound effect for Rain of Blood. * Chosen of Dvalin is now a front rank unit. * Modding: Leaders could not be combined with newmonster, fixed. * Modding: Modded sprites were drawn too small, fixed. * Modding: With addstartunits it was possible to assign an immobile unit to a commander, fixed. * Version 3.08 sent to Desura and Gamersgate. Can be downloaded as soon as they have made it available which might take a day or so. * Manuals updated to version 3.08. Can be downloaded from the coe3 page. * 8 players with clustered start and tiny map could crash during world creation, fixed. * Revelry spawns slightly more monsters. * New mod commands: allitemslots, weaponslots, noslots, nobootslot, miscslots. * Modding: selectmonster can take an offset to alter monsters with the same name. * Some switches no longer had precedence over loaded settings, fixed. * Maps: Triggers ownsterrevent and hasmonevent with player -1 can now be used with events depending on player triggering the event. * Global trade bonus printed in income details. * Class modding: goldbonus, ironbonus, tradebonus didn't work on classes that already had these advantages, fixed. * Mod banners are packed towards the top. * Maps: Coordinates -4,-1 can be used for home position of player triggering the event. * Modding: 18 new commands to make moddable summoning/mastery commanders possible. * Modding: siegeweapon, assassinweapon, prebatweapon. * Modding: guibartex didn't take effect until restart, fixed. * Captain and scout offers were missing for Baron, fixed. * Bakemono General was missing from Bakemono's start units, fixed. * Modding: Adding a sprite to a newmonster didn't work (ConvArmyNbr error) making the newmonster command useless, fixed. * Modding: newmonsters now start with sane default values to stats. * Modding: Added resource gathering abilities to enable e.g. a new kind of demonologist to gather sacrifices. * Modding: newclass could crash the game, fixed. * Modding: setclassname didn't work properly, fixed. * Modding: guiborderthintex only affected the terrain popup and not the other popups, fixed. * Shock aura did cold damage instead of shock damage, fixed. * Drop boulder did wrong type of damage, fixed. * Modding: 53 new commands for monster special abilites. That should cover most of what is possible to do with a monster in CoE3. * Modding: copystats. * Manuals updated to version 3.06. Can be downloaded from the coe3 page. * Fire spell casters could not really burn forests after all, fixed. * Shift+B burns forest directly. 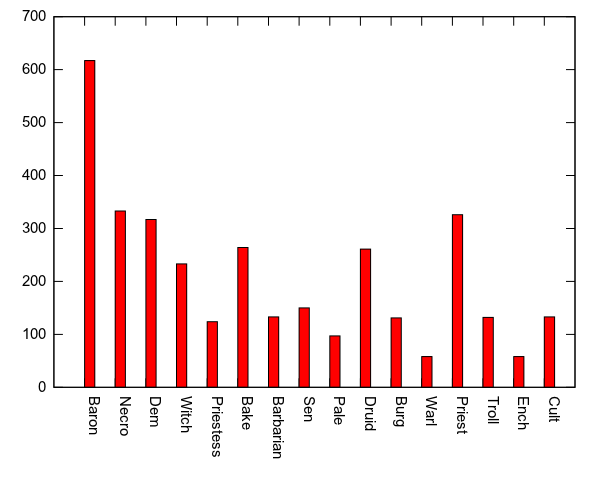 * Max event message length increased 127 -> 2047 characters. * Support for 1280x768 resolution. * More differentiation of different societies. * Some Iron Arcana spells had wrong stats, fixed. * Warning: when upgrading to 3.06 old save files will no longer work. * Outpost, cloud castle and desert palace are siegeable. * Some southern terrain could appear despite it being disabled, fixed. * Burn forest spells didn't work for leaders, fixed. * Sometimes there was missing halberdiers in the King's castle, fixed. * Archmage was missing from his citadel, fixed. * Added cancel button to 'choose participants' screen. * Knowing certain spells grants the burn forest ability. * Modding: clearstartunits, addstartunits, addstartcom, setmaincom, setclassname. * Modding: hometerr, clearstartterr, addstartterr, newclass. * Mod banners not shown after a game has started. * Map editing: Event pos -4,p to have event at home of player p.
* Improved message when no commander can receive a found item. * Will o'the Wisp now only floating with no flying. * Villages around King's castle could in rare circumstances produce gems, fixed. * Tab to show items in army screen. * Poison cloud spells target random row instead of first row. * Old save file no longer compatible, due to new El priest stuff. * No assassinations at failed summoning battles. * Space = Mark commander as done for the current turn only and goto next commander. * Map editing: chainevent, maybechainevent. * Mac OSX version now saves stuff in ~/.coe3 instead of in application bundle. * Always get to reenter key next time if you get an 'invalid serial key' message. * AI: improved army strength assessments. Now takes army composition and more special abilities into account. * AI: AI slightly more aggressive. * Class modding: selectclass, clearrec, addunitrec, addmercrec, addcomrec, templerec, libraryrec. * Class modding: nostdtroops, stdtroops, recwizchance, recherochance, recasschance. * Game exits with error message on unknown mod command. * 'b' exits burn forest screen. * No message when pressing 'b' for people who cannot burn forests. * Map editing: Event position -1,-1 = last location, -2,-2 = random location, -3,-3 = random land location. * Max number of events for a map increased 1000 -> 3000. * Demo version uploaded to Desura. * Game remembers old ip address. * Bumper harvest could happen during a drought, fixed. * Added a shortcut icon for this page. * Background fade when viewing commander stats from main map. * New monster modding commands, including many special abilities and weapons. * Ice Devil had incorrect MR, fixed. * Battle screens from independent fights that shouldn't be seen could sometimes flash by quickly, fixed. * Etherealness spells was sometimes targeted at ethereal beings, fixed. * Using extremely small map sizes would cause random map creation to hang, fixed. * The order of menu items in the misc menu was wrong, fixed. * Certain undead creatures now have the inanimate ability. * New mod commands: lighttextcolor and darktextcolor. * All special power shortcuts for Druid and Necromancer didn't work from map screen, fixed. * Fixed spell save file breakage from 3.00. * Hellhound can no longer bite and breathe at the same time. * Shortcuts for necromancer powers. * Mummy has an equipable touch of the dead. * Sound effect for vampire transformation. * Some shortcuts changed so they can work from map screen too. * Vampire could not upgrade, fixed. * Bad default TEMP directory on Windows if environment variable is not set, fixed. * Some new or altered sprites. * Get to play one turn after defeat when using --battlereports in order to see the last battles. * Boar Warrior is unique reqruitment, Epona cavalry is not. * F5 to view score graphs (if enabled) during 'Conan is playing' in network play. * Faster scroll wheel zoom speed. * Mounted scout for barbarian. * Year shown in season popup. * No terrain popup when mouse is inside income or commander box. * Season show on network wait screen. * One new spiritism spell. * Werebear is now a unique reqruitment. * Barbarian starts with a random totem pole. * Necromancer sensed dead animals too, which does not correspond with what can be raised, fixed. * Dots showing AP left were not always correct, fixed. * 's' and 'f' can now be used to both select and deselect. * Rune Smith now requires dwarves of appropriate type to create elite dwarves. No more force growing from the Dvala, so she no longer needs to be present. * Daughter of Dvalin now pops 3 dwarves per months. * Reanimated target didn't always follow reanimator automatically (bolt of unlife, doppelgangers), fixed. * Meteor crash site is now revealed to the entire world. * New Hero messages has a goto commander button. * Single player games no longer have a 'Conan's turn' message before every turn (old games are not affected). * Income overview shows modified income per terrain type too. * Game Over reveals score graphs and map. * Experienced Retiarius got disease causing net attack, fixed. * Very limited modding support is starting to appear. * It is now possible to plant Shadow Trees in cannibal villages. * Mindless beings can no longer get mental afflictions. * Less bright player colors. * Map commands: Player -1 on events used for the player that triggered the event. * Troll forests could not be burned down, fixed. * Mounted Ancestral Barbarians are now fast. * Portals could cause game to crash during AI movement, fixed. * Command line switch passed through the Desura start script on Linux. * Ettin replaced both weapons with one magic weapon, fixed. * Archmage citadel got extended vision. * Manticore flick barb had wrong sound effect, fixed. * Improved file name sanitation. * 's' changed to remove slow units. * 'f' changed to remove fast units. * +/- to select/deselect 10 unit of a specific type at once. * 2 new random events. * Deserted town could not be sieged, fixed. * Dragon did not cost gold, fixed. * Sound system shut down properly on exit now. * Removed flicker when moving with keyboard. * Mages will no longer cast fire resistance on fire elementals and similar. * Longdead triarius didn't have a long pike, fixed. * Moving on very large maps was slow, fixed. * New ability: Non magical invulnerability. * Mind Slime Horror had broken confusion, fixed. * There was a small chance for a stop/junk sprite to appear in mountains, fixed. * Manflayer is now fast. * Mound king can start with magic items. * Watchtower sightings not updated correctly to allies in network game, fixed. * Player out messages will say who defeated the player. * Not possible to make druid major summon in brigand lair, fixed. * All textures loaded on demand. * Map editor map size incorrectly limited to 127, fixed. * Right click descriptions for necromancer rituals. * Deleting a save game with a strange symbol in it could crash the game, fixed. * Save file name sanitation. * Map editor creates sea in new territory. * Scepter of the goblin king does Flame Burst. * Slight magic item info layout changes. * Right click descriptions for troll rituals. * Setting to show/hide move of allied AI players. * View independent move was broken, fixed. * Added river exits to the north/south/west. * Connect river function can create river exits too. * Manual can be opened from main menu. * Lowered high xp levels. * Adjusted some sound effect volumes. * Minor typo and stat fixes. * More short style command line options. * Fixed game over message for network games. * Bolt of Unlife doesn't reanimate undead and constructs. * New sprites and stats for ancient presence, swamp god and wyrm. * Could see first AI movement when playing two human players, fixed. * Can scroll viewarmy screen. * Mac shortcuts for quit and minimize should work better now. * ä didn't print correctly, fixed. * Num pad can be used for movement. * Mercenaries (that can be recruited instantly) are colored green. * Winter move penalty doesn't affects the sea. * Wizards will no longer cast fear spells on mindless beings. * Independents could move into impassable mountains, fixed. * Fix to prevent multiple unique monsters to appear by map commands. * Slight reduction of gold mine guards. * 2 new stats in monster info. Kills and ranks. * Helpful popups for all monster stats. * Murder of Crows got a ranged attack. * Regenerating creatures must be killed 125% or they may rise after the battle. * It was possible to see stealthy units while they moved, fixed. * Fixed missing high priestess starting troops. * Pictures and information on recruitables. * Default AI level changed to Jester (no resource bonus). * Dwarves got proper dwarf names. * Settings for AI move delay and show independents. * A remove all fancy terrains button in the map editor. * Creating a new random map clears all square names. * Some missing descriptions fixed. * Can see AI moving when playing single player. * New switches: --movedelay, --aidelay. * Version number moved from preferences to credits screen. * Magic Cave gem income changed 3 -> 2. * class 0 in fixedplayer command now results in a fixed random player. * New illusion spell: Displace Self. * Updated SDL version on Windows. * Alt+F4 to quit in windows. * Improved attacks on gold mine. * Senator could use bridge as citadel, fixed. * AI players receive more suitable names. * Popup for damage types. * AI Troll Mum could freeze, fixed. * Colossus moves on its own. * Sound effect volume saved. * New graphics for some terrains. Conquest of Elysium 3 is now available for preorder on Desura. The game will be released on 20th February at the latest and there is a 15% discount on preorders. * Fixed missing dwarf queen description. * Gold rain on game over screen. * Setting for sound effect volume too. * cmd+q to quit on mac. * quit confirmation required after playing a turn. * Removed debug information and debug console. * Most of the music in place. * OSX had Linux sound device options, removed. * Credits can be exited by mouse click too. * Cancel button on enter serial key. * Some new particle effects for spells. * Need no longer stand in coe3 directory to start game. * Mac OSX version created. * Gamelog missing a few commas, fixed. * Air shield no longer cast against non archers. * Some class descriptions updated. * You could get many spoils of war from 1 merchant, fixed. * Proper ALSA sound support in Linux. * Libraries give increased chance of getting wizard offers. * Temples give more offers from shamans, priests etc. Screenshots have been updated and CoE3 has been added to indiedb.com. * New fire look for arch devil. * Lord of Corruption's corruption is instant. * Enslave is instant i.e. enslaved unit will participate in same battle but on the other side. * Druid horse uses old horse sprite. * --gamelog to get a log file with statistics every turn. * File name sanity checks. * Improved jack sound support. * Can scroll screen with up/down arrow keys in order to setup really huge armies. * Commander box rezoomed when you have very many commanders in the same square. * Gets a message proclaiming game winner in network game. * Descriptions for all classes. * Invoking Baal will create a two year red moon and drought. * Improved game over behavior in network games. * Star Spawn can become Elder Star Spawn. * New sprites for Star Spawn and Iron Golem. * Gold mine converts defending workers into better dwarves over time. * Reduced summoning costs for High Priestess. * Invoke Baal button only appears for Anointed Priestess. * Support for compressed stereo music. * Minor stat and typo fixes. * Max memorized spells increased to 30. * Summonings did not strike first in network games, fixed. * Shopped units are now immediately visible for allies in network games. * Doppelganger did not get item slots from target he looked like, fixed. * Fire brand fire attack affects 3 enemies. * Weakness affected spell casting, fixed. * Max known spells increased to 40 to accommodate boosted beholders. * Shock aura didn't work, fixed. * Dwarves get their current HP upgraded as well when bought. * Prince of Death summons both longdead and soulless before battle starts. * Wide units will no longer cause extra holes in battle lines. * Description for high priestess. * A dmg 1 attack has a 20% value of becoming a dmg 2 attack, enabling snakes a small chance to damage armored units. * Icon and application type set for Pulseaudio. * Having only 2 fixedplayer resulted in an unwanted third player as well, fixed. * 'b' selects diseased units too. * Oracle scrying now also exits menu after scrying. * Demonologist limited in sacrifice sizes. * Cultist can summon greater demons, but only with small sacrifice size. * Air shield now only affects missiles. * Awe now only protects from front row attacks. * Visual effects when awe and air shield protects. * Various air elementals have permanent air shield. * Deselect all 'a' didn't work in square with immobile, fixed. * Dead were not always removed when they were zombified in a network game, fixed. * Disconnecting and reconnecting no longer gives you extra Action Points. * Enchanter can create portals. * AI warlock let the apprentice do all the work, fixed. * Gems weren't removed from destroyed mines, fixed. * More types of spell casters counts as potential fire threats. * Summonings and square conquests can been seen instantly by allies in network game. * Common Cause option, causes all allies to be eliminated simultaneously. * Elementals have no misc slots. * Toned down borders on item slots. * You can get info on adjacent square by pressing one of QWEASDZXC. * Manikins could start fight against allies and themselves at once, fixed. * More effects do not awaken units. * Sleeping targets are immune to fear. * Own commanders are always shown on map if in same square as ally. * Network games must be saved on server. * Sound effect for 'hide heart' ritual. * 'Select next commander automatically' works better now. * Next commander preference saved. * You are not awakened by pure poison attacks like poison cloud. * Misc menu on map screen that lists all menus not otherwise clickable. * Can access character description when playing. * max map size -> 159x159. * Summoning of unique beings that where already dead resulted in too many demon lords, fixed. * A Major demon was incorrectly unique. * Raise dead at an ally's location now works like it should. * 'l' to deselect landlubbers. * Special power shortcuts can be used directly from map screen. * Swamp summonings for druid. * More spells for undead and demons. * Help screen (?) for map editor. * New graphics for Demonologist's castle, pyramids, skull cave, ballista. * Eye in a pyramid symbol for squares you can see extra far from (e.g. watch towers). * Description for High Cultist. * Season prolonging sites can now be turned on and off and will prolong its season automatically but not more than an extra month or two. * Some unused terrains remade for map editing purposes. * Get error message if client is too old in network game. * Allied simultaneous turns is now the only type of network game. * Item slots are shown even when empty. * Can see further from towers. * Forests do not see outside themselves. * New units for Troll King. * Library is now free to use but has limited nbr of uses. * Network load game bug fix. * Water breathing items added. * Most larger horrors can now move underwater too. * Ally could steal allied's square by participating in a fight there, fixed. * Dwarf Workers no longer follow their queen when they are popped. * Easy to see where dwarf workers can be converted. * Save files are now saved with proper names in a 'saves' directory. * --loadgame to enable text only servers to continue on old games. * max map size -> 127x127. * Confirmation required to exit network game. * Friendly error message if serial key is missing when using --textonly. * Simultaneous allied turns is now the default for network games. * Map editor reconnect rivers no longer destroys delta. * Map editor create coastline no longer destroys coastal villages. * Auras can no longer be negated by awe and some similar fixes. * Mapeditor removes spaces from filenames. * Barbarian AI could make Army of Legends anywhere, fixed. * New spell effect: confusion. * New character: Dwarf Queen. * Senator can buy ballistas. * Siege engines cost more iron and less gold. * Can see fights in scryed territories. * Get a small scry on send horror location. * New graphics for some monsters. * New graphics for castle. * 'v' to view first battle. * New monster: Gelantineous Cube. * Bakemono O Kunshu now gets 2 level 3 spells. * 2 bugs with incorrect battle replays fixed (caused by poison and wide monsters). * Crossalpha can be set in settings menu. * AI less likely to burn himself to death. * Some class descriptions got improved. * New skull cave graphics. * Scrying reveals invisible troops. * Golems have updated stats. * Scrying helps allies too. * Scrying and terrain changes are shown for simultaneous players too. AI vs AI competition update. The Baron is still at the top but the Druid, Burgmeister and Warlock seem to do a lot better now. But most importantly the game is still very stable when it comes to AI vs AI matches. * AI improvements for burgmeister and enchanter. * Warlock cave now produces 2 gold & 3 gems. * Pale one summoning costs 100 -> 70. * Oak golem cost 20 -> 40. * Barbarians could remain berserked from disease damage, fixed. * Mapeditor selectable from main screen. * Maps loadable via a menu. * Create dancing sword 2AP -> 1AP. * Spells that shouldn't affect undead didn't work that way, fixed. * Ritual of necromantic mastery now costs 1 AP too. * Stupidity affliction replaced by temporary insanity. * Map editor map bug fixes. * Missing descriptions, typos and cosmetic fixes. * Monument of order couldn't be owned, fixed. * Cannibal queen could sometimes cast spells from both her paths in the same round, fixed. * Game crashed when recruiting on long and narrow maps, fixed. * Can now see allied movements during 'waiting for your turn'. * Adjustable transparency on follower marks, default 50%. * Can see when allies move. * Sound and look improvements for some attacks and spells. * Snake charmer and fakir got abilities. * Option to have all team members do their turns simultaneously in a network game. * Bug with secondary secondary effects fixed. * 2 new map event triggers implemented. * Port trade reduced to 2. * Terrain popups active during 'waiting for your turn'. * Basic map editor working. * Multiple gold mines possible. * Impassable mountains added for map making purposes. * Rudimentary scenario map commands implemented. * Can zoom out further. * Max map size 255*255. * Warlock has a few more starting troops. * Descriptions for most classes. * New animals and druid summonings. * Astrology was bugged, fixed. * New spell: mirror image. * Cannibal queen only casts one spell per round. * Advanced setup options including clustered start for team members. * Single right click to view enemy armies. * Long right click on citadel to recruit there. * You could see light effect from AI scryings, fixed. * Hopefully old weapon masters will appear in farms now. * Vampires will no longer drown when consuming a coastal village. * Higher level spells for warlock apprentice, just in case. * Improved graphics for some terrain squares. * Wooden towers can be owned by everyone. * Magic weapon only replaces first type of weapon. * Mages didn't cast resist poison against units with poison bite, fixed. * Some icons for battle effects have changed into pentagrams. * Pale ones have bad sight. * Slightly reduced spawn rate of independents. * Can turn disconnected players into AI. * Can reenter an ongoing network game. * Frog and cat were too strong, fixed. * Carrion can no longer lead units. * Guard tower looked wrong when recruiting, fixed. * Baron starts with slightly fewer spearmen. * -> 0 AP when failed summoning. * Too many HP when polymorphing back from stronger form, fixed. * Improved magic item info. * AI will no longer see through doppelgangers, werewolves, etc. * AI improvements for enchanter. * Cannot burn forests during winter. * Fixed network weirdness when waiting for other player to enter name. * Skipping battles with mouse could result in permanently skipped battles, fixed. * Sound effect for enchanter mastery. * Mages will no longer cast sleep spells on undead. * Cannot place insane commanders under another commander while insane. * Fixed some minor map graphics bugs. * You got no battle reports when you were attacked, fixed. * Shortcuts for some enchanter summonings. * Slightly thinner crosses when selecting followers. * Network fixes for windows. You can have server and client on same computer in Windows too now. * Descriptions for all societies. * Societies now in chronlogical order. * Senator can use wooden towers as citadels. * Troll King can use ancient forests as citadels. * Highlighting of scryed squares. * Dark knowledge exits necromancy screen. * Reveler can perform a reveling in an ancient forest. * Stupid units have own section in F1 unit overview. * Game crashed when not setting all options in a text only server, fixed. * Game server used 100% cpu when running in text only mode, fixed. * Sentried commanders are greyed out on F1 and will be unsentried if clicked on. * Insane commanders are redded out on F1. * AP left shown on F1 screen. * Old weapon masters will only appear if you own a farm. * Unexpected heroes will only appear if you own a village. * Chill of the Dead was wacko, fixed. * Fallen Empire has a fallen capital with undead and horrors. * Pressing tab shows map without icons on it. Here are the results from the latest AI vs AI competion in CoE3. 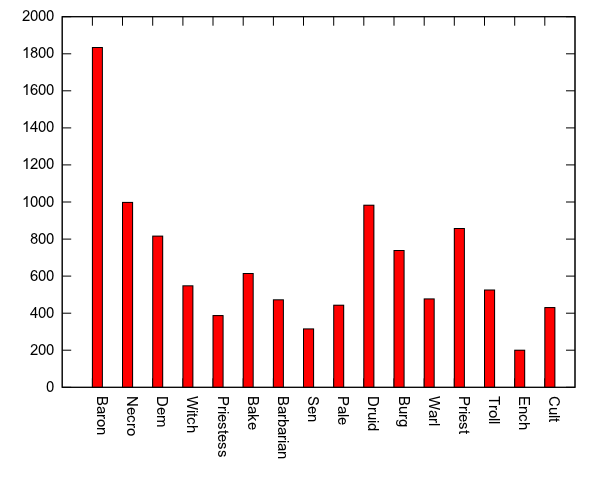 It shows how many times each class won in an automated test that consisted of a few thousand games. This AI competiton is quite useful in order to find bugs that crash or freeze the game. It is also useful to see how the AI performs with all classes. The baron looks a bit better than the rest, but that's ok, the baron should be an easy class to play for the AI. * Updated graphics for some start locations. * Unit overview on F1. * Messages are now cleared between games. * Necromancer couldn't raise dead when only 1 AP left, fixed. * Iron income overview fix. * Immortals could cause an infinite amount of battles, fixed. * Multiple battles can now occur in the same square, one after another. * Names should be correct now. * There should be descriptions for all special abilities now. * q no longer skips multiple battles. * --textonly disable sound too. * Fatigue replaced with XP on unit stats screen. * Don't cast charm on charm immune targets. * High Cultist and the horror summonings should work now. * Demon whip (and similar weapons) didn't work, fixed. * Iron wasn't saved/loaded properly. * Skipping battle now skips it instantly. * Recruitment offers merged into one message. * z = slow motion in battles. * ? to see keyboard shortcuts in battle. * Ceremony of Mastery for Deep Cultist didn't work, fixed. * Earth grip could result in all manner of affliction and weirdness, fixed. * Text mode can be used on server. * Proportional portrait size when viewing unit stats. * Beholder info scaled down so all spells will fit on the stats screen. * Canceling out of network menus doesn't quit the game. * Default port is 7272. * Ghouls cannot reproduce on ethereal beings. * Heroes won't start in allied's farms. * Network fixes, should work now. * Command line switches for new game creation. * High Cultist not always able to get a proper start position, fixed. * Graveyard was wrong size, fixed. * New swords to indicate battle. * Horror and death realm events are more rare. * New event: Fungus Year. * Dragon, Horror etc. now actually has to fight the dwarf king to get the gold mine. * Enchanter's coal mine contained no gems, fixed. * Battle summonings appear instantly and don't reorder units more than necessary. * Player colors shown on the choose participants screen. * Window opacity setting now affects window title too. * Add new player didn't get greyed out properly, fixed. * New player copies settings from previous player. * New symbol for magic damage. * Hill giant increased damage on boulder (siege attack). * Roc also increased damage on siege attack. * No longer forget what's in squares on the same turn. * CoE3 logo and version number on main menu background. * Some blood spells won't affect constructs. * Some income symbols look wrong on map popup, fixed. * Cannot bring along stupids any longer. * Typos in class descriptions, fixed. * Got merchant gold message if you died on him, fixed. * Redesigned trade admin screen. * Redesigned screens for special powers. * Redesigned dialogue boxes for Preferences and Random Map Settings. * New higher resolution window border. * Werewolves not revealed on popup. * Magic items look poisoned, fixed. * Zoom level per player. * New sprite for sleep immunity. * Colossus square remained owned even though it had been used up, fixed. * Transparent icon in windows. * Added corpse count for animals. * Troll Mum now creates single troll forests that auto spawns manikins, blood fungus and such. * Manikins are stupid and moves independently. * Old weapon master now appears in a farm if possible. * Temporary pics for slow and forest stealth. * Doppelganger not shown on chit. * AI only prolong seasons that are useful. * Blobs doesn't ruin coastline. * Totem pole for barbarian.